Every year, as a Christmas gift to my parents, siblings and their families, I bake a dinner. The best time for everyone to come is between Christmas and New Years. I have enjoyed starting this tradition and hope to keep it up as long as I can. Everyone always asks, "What can I bring?" and my dad always insists on paying for the meat. I held firm, saying, "Just come; bring an appetite and enjoy yourselves." The cheese ball and crackers (which was not salt~legal) were compensated by having a large variety of fresh fruits. This kept everyone busy until the next course. Next came green salads: Romaine and Mixed Greens. Plenty of veggies were offered and a variety of dressings, including olive oil and balsamic vinegar. The salad was paired with Ina Garten's Cream of Fresh Tomato Soup. This soup, made with low, organic chicken stock, skinned and seeded roma tomatoes, and heavy cream (low salt, too!) was enjoyed by even the pickiest of eaters in my family. Drizzle a little bit of balsamic vinegar, and you're in heaven! I did not have fresh basil on hand, so I put in some of my frozen "pistou" which is similar to pesto, but without the cheese and salt. For the main course, I made the customary Herb Roasted Turkey. 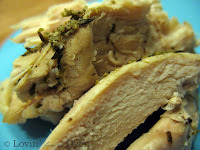 All frozen turkey breasts have salt in it, so next time, I'll have to look for a fresh turkey. As a secondary option, I made a 9.5 pound Prime Rib for the first time. I could not believe how incredibly EASY and tasty this was. At $2.39/pound, this was a steal. I let the meat come to room temperature for about an hour. I cut the rib bone till it was nearly off and tied the roast with string that I got from the butcher. This made it so much easier to carve after it was cooked. 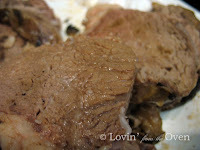 I cut slits all over the roast and added sliced garlic. I then covered the entire surface with fresh chopped rosemary. Put it on a roasting pan and into a hot, 500º F oven. After almost 15 minutes, my smoke alarm went off. I turned the oven down to 325ºF. Stuck a probe into the meat (make sure you don't touch any bone) and set the probe for 130ºF. If you don't have an oven probe, I recommend looking at Thermoworks Cooking Thermometer that I saw on America's Test Kitchen. You just stick the probe into your meat, run the wire to the outside of your oven and put the other end on the counter. It even has a magnet on the back which will let you stick it on your oven door panel, if it is metal. After almost 3 hours, the probe beeped at 130ºF and shut my oven off. 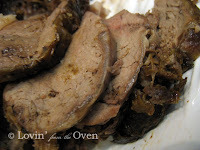 I took out the meat, covered it with foil and placed it in a clean roasting pan. After letting it rest for an hour, it was the PERFECT medium, with just a touch of pink in the middle. YUM! My father-in-law provided the fresh horseradish, which was enjoyed by several family members. Dinner rolls are a MUST in my home. Roasted red potatoes (drizzling some canola oil, sprinkling onion powder, and adding chopped fresh rosemary on top and baking at 375ºF for an hour) and pressure cooked baby carrots complimented nicely. 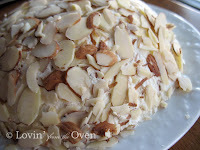 To round everything off with a sweet finish, I offered two different angel food cakes. 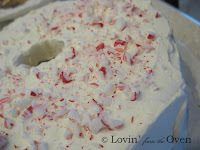 I made a white angel food cake, made some fresh whipped cream and my son crushed some peppermint candies for me. The candies will melt into the whip cream over time, so it is best to put them on just before serving. 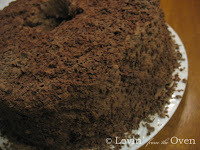 My chocolate angel food cake was covered in fresh whipped cream, but with a 5 oz. box of instant pudding mix added in and grated chocolate bar shavings on top. What could be better than family and good food? Mmm, your menu makes my mouth water! Yum! I bet your family really enjoyed all that good home cooked food! What a fantastic holiday menu. It's funny how we're so stuffed at the time, but two weeks later I could just dive head first into this meal. YUM! Wow, Frieda. What an undertaking. Good for you. It's great to be able to spend time with family, isn't it! I bet they loved it. It all looks wonderful. Damn..... what a wonderful meal. Yummy! I wish I had been invited for dinner. What a great menu! The white angel cake looks amazing!